Today I received the @Flinders University Vice-Chancellor’s Prize for Doctoral Thesis Excellence. Thank you to the #nurses who shared their experience of being in a #disaster and made this work possible. Disasters disrupt the normal functioning of communities. From a health perspective, disasters may place an increased demand on health services within affected communities. When a disaster occurs, Australian nurses may respond as part of a government or non-government disaster medical assistance team. There is an increasing international literature base of nurses’ personal experiences and descriptions of single disastrous events. 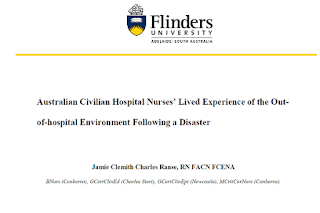 However, Australian civilian hospital nurses’ lived experience of the out-of-hospital environment following a disaster has not yet been explored. Phenomenology is concerned with the essence of things as they are appearing in the conscious awareness of the first person. This phenomenological study uncovered what it may be like being an Australian civilian hospital nurse in the out-of-hospital environment following a disaster. Hermeneutics and phenomenology formed the theoretical framework for this study. While there is no one way to do phenomenology and get back to the things themselves as they are appearing in themselves, for this study, an epoché and reduction were the key methods of phenomenology in guiding a way. To get to the essence of the phenomenon being uncovered, narrative was obtained from eight participants, using semi-structured interviews at two points in time. Participants were Australian civilian hospital nurses who had worked in the out-of-hospital disaster environment as part of a disaster medical assistance team. From the participant narratives, descriptive moments formed a lived-experience description as an anecdote of what it may be like being a nurse in an out-of-hospital environment following a disaster. The uncovered moments in this study included ‘on the way to a disaster’, ‘prior to starting work’, ‘working a shift in a disaster’, ‘end of a shift’ and ‘returning home’. Phenomenological reflections of the existentials of spatiality, corporeality, communality and temporality overlaid the moments of the lived-experience description. Commentary on the phenomenological reflections provided further depth to the insights of what it may be like being an Australian civilian hospital nurse in the out-of-hospital environment following a disaster. A nurse’s experience following a disaster, from a spatial perspective, was described in this study as lived-space as shrinking then opening too-wide, and disaster health lived-space as occupying, sharing and giving back. From a corporeal perspective, their experience was described as a nurse’s lived-body, for nursing following a disaster, and a nurse’s lived-body, for patients following a disaster. From a communal perspective, their experience was described as with colleagues, being relationally close; with patients and their families, being an insider; and being with self. From a temporal perspective, their experience was described as kairos time speeding up and condensing and kairos time slowing down and stretching. Chronos time emerged as a featured backdrop to the life-world of what it may be like being an Australian civilian hospital nurse in the out-of-hospital environment following a disaster. In particular, chronos time was described as intersecting between the uncovered moments and the phenomenological existentials as a way to gain greater insights of a possible experience. These insights, in turn, informed possibilities for future practice, future education and professional development, and future research related to the experience of an Australian civilian hospital nurse in the out-of-hospital disaster environment as part of a disaster medical assistance team following a disaster. Ranse, J. (2017). Australian civilian hospital nurses’ lived experience of an out-of-hospital environment following a disaster. Doctorate of Philosophy, Flinders University, South Australia.